So hey guys, have we all noticed how cold it's gotten? Brrrr. The puffy jacket and scarf are coming out every day (the gloves would too, but I've forgotten where I kept them), we've got the electric blanket on (aaaah), and I'm downing endless cups of tea. Naturally, with the colder weather, my meal preps need to do their part too. 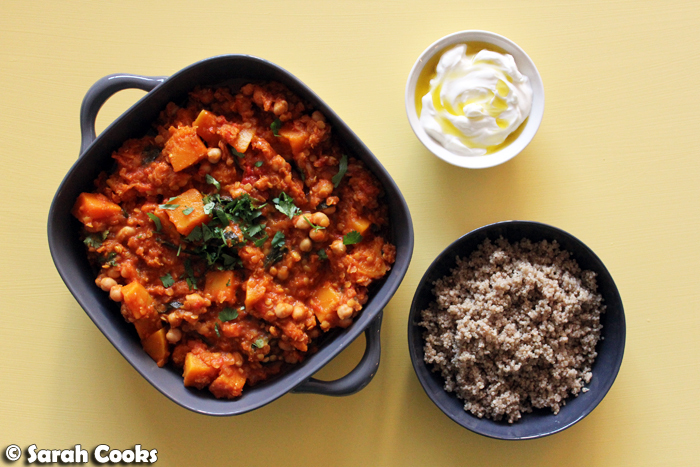 And with that in mind, let me present to you... my golden butternut and chickpea stew, served with quinoa and yogurt. This vaguely Middle-Eastern inspired stew is full of vegetables and vegetarian protein (chickpeas and red lentils), making it filling and comforting but not stodgy. 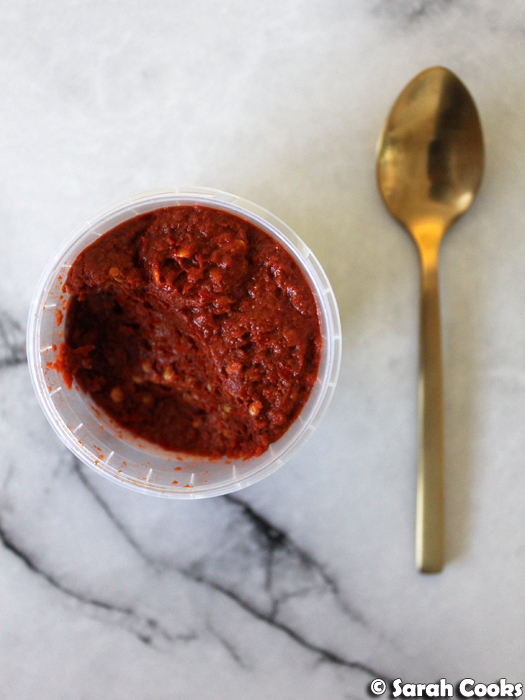 A flavour base of harissa paste makes it wonderfully spicy. It's the culinary equivalent of an electric blanket. (I'm sitting underneath one as I type this post, and it's pretty darn great). I improvised this stew - my starting point was half a butternut squash in the fridge, which I thought would make a great base for a warming, golden vegetable stew with some fiery harissa and nutty chickpeas. As I was cooking, I kept adding things that would increase the golden warmth factor - steeping saffron threads in the stock, adding minced ginger to the base of onions and garlic, lots of fragrant spices (turmeric! paprika! cinnamon! ), red lentils, and when serving, a gorgeously golden green drizzle of extra virgin olive oil. And speaking of green, there's a little spinach thrown in there too, for good measure, plus a sprinkling of fresh coriander at the end. I bought this harissa at a local deli, and I loved it! 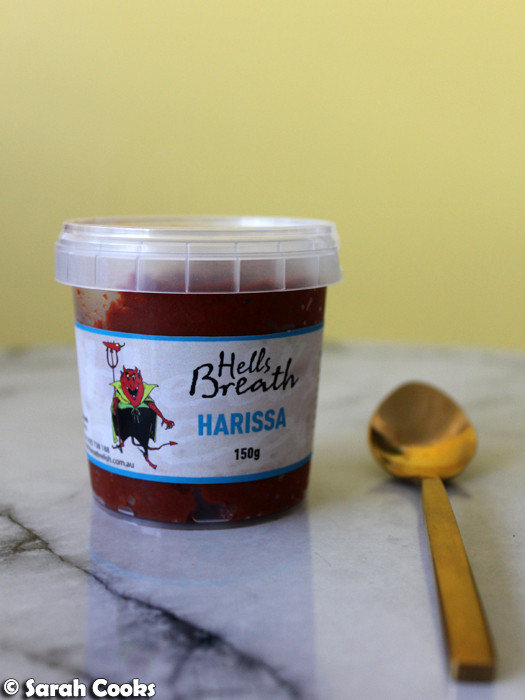 It can be hard to find a good harissa - the major supermarkets don't seem to stock it (not my local branches, anyway), and lots of gourmet shops seem to sell milder versions of harissa that are made of capsicums and tomatoes rather than chillies. Having said that, I have no idea what constitutes a "good" or "authentic" harissa, all I know is what I like - a really thick, almost dry, paste, with heaps of garlic and caraway. And of course it has to be really bloody hot. I've made harissa before, (Nigella's recipe, from How to Eat, is excellent), and it's well worth doing if you have the time. Funnily enough, five years ago, I wrote: "I can't justify spending $12 on a jar of expensive harissa from designer supermarkets, when it's so cheap to make at home". Hah! Clearly I've become quite the baller in the last five years. I served the stew with quinoa, for extra protein and fibre. However, a buttered couscous would be an excellent accompaniment too, especially if studded with pomegranate seeds, barberries or sultanas, and sprinkled with pine nuts. For me, the Greek yogurt isn't an optional extra, but a mandatory addition - it's so creamy and cooling against the spicy stew. 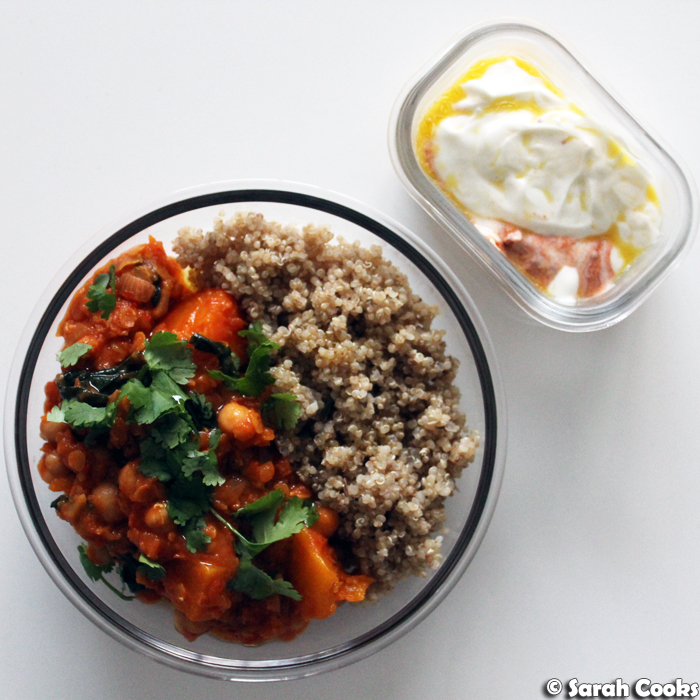 If you're feeling up for it, and like spice as much as I do, stir a little harissa through the yogurt - also delicious. Let's talk dietary requirements! This recipe is vegetarian, gluten free, and easily veganisable if you substitute the Greek yogurt with your favourite vegan alternative. In the recipe, I specify chicken stock (again, more rich and golden than vegetable stock), but use a vegetable stock if you want to keep this vegetarian. And actually, I used Massel "chicken" stock powder, which, as it turns out, is vegan! So there you go. I cannot overemphasise how much I loved this stew! My usual meal-preps make four servings; this one made eight, and I regretted nothing! I kept a big container of it in the fridge, and kept taking individual servings out of it. I had this for lunch at work every day, and often for dinner as well, and I was still looking forward to it by the last dinner. Obviously, you could just make this for dinner or for guests, and indeed, it'd be a great option if your friends have lots of dietary requirements. However, it was a particularly excellent meal prep. Apart from tasting fantastic and being healthy, it transported well and held up throughout the week. Heat the chicken stock and add the saffron. Set aside and allow to infuse. Heat the 1 tablespoon olive oil in a large casserole. Add the onion, garlic and ginger. Season with salt and pepper, and cook for 5-10 minutes, or until the onion is softened. Add the harissa and spices, and stir to mix. Add the butternut squash and lentils, stirring to coat them in the delicious oily spices. Add the stock and chopped tomatoes. Stir to combine. Bring to the boil, then turn down to a simmer and cook for 20 minutes, or until the lentils and pumpkin are almost cooked. Add the chickpeas and cook for a further 10 minutes. Add the spinach leaves, and stir until the spinach is wilted. Drizzle with extra virgin olive oil and chopped fresh coriander before serving. Serve with Greek yogurt and cooked quinoa.